Hello! My name is Madison Rhoades. My husband, Luke, and I own Cross Roads Escape Games (Get it? Rhoades… Roads…? Well, we thought it was cool). I am the designer and scenic painter. He builds and makes my crazy ideas come to life. I love puns! I agree that it’s cool. My husband and I love theatre. We did it in high school and college. I got my degree in set design & scenic painting at USC. His was in Scenic Carpentry at Vanguard University. We loved it, but honestly, we hated working with actors. Almost always we had some diva of the show tell us how to do our job. We decided that theatre would be perfect if it didn’t have any actors, but it also seemed kinda impossible. A few years later we played The Basement (back when it very first opened). We thought we were going to a haunted house, boy were we wrong! It was actually our first ever escape game, us 2 with 10 strangers. Needless to say, it was a hot mess, but SO MUCH FUN! We talked about it for months afterwards. Almost immediately we had our idea for The Hex Room and thats when we found out that we could actually make theatre without any actors. It was perfect. All of our sets are completely custom built. We have played quite a few escape games and found them to usually be inside prebuilt office buildings. We made sure to find a space with a huge warehouse so we could make our games exactly the way we wanted, built from the ground up. Our Hex Room game is super unique. The story is a horror movie loving mad man wants to recreate a horror movie using you as his cast. What makes it super cool is that we have everyone fill out a questionnaire beforehand to find out which cliche horror movie victim they are: Virgin, Rebel, Prom Queen, Jock, Detective, or Nerd. We give you costume pieces so you truly become your character and then we put everyone in a room by themselves. This makes it so everyone has to participate and it also makes it replayable! You can come back and play The Hex Room as a different character and have a completely new experience. Even though you are apart from your group you do still have to work together as a team by relying information and sending objects from room to room to help your team get out, and hopefully they do the same for you. The Fun House is the exact opposite of The Hex Room. This game is more silly and whimsical. The set is seriously beautiful. Its like stepping into a circus version of Alice in Wonderland. In this game you have to ask Zoltar for hints, who is a very sassy painting on the wall. It’s probably the best part of the game. Hex is absolutely replayable. I’ve played it twice. It was fun and different both times. That’s hard to answer. I think all of them play a key point in an overall great game. For us, we definitely pay a lot of attention to detail when it comes to our set. We really believe an immersive atmosphere is very important. Everything from set, lighting, and sound can help tell a story on its own. Our puzzles are also custom built and completely from our own heads, so its something new that players have not seen before. I think what is very important that your puzzles should work with your theme and story. I personally hate it when I play a game that is suppose to take place in a dungeon but I am solving a puzzle that has to do with the periodic table on the wall… or a sudoku puzzle…? There needs to be a reason why you are solving these puzzles and why they are there in the space. I really think that gets overlooked a lot. Cohesiveness, I guess, is what I think is the most important. “The key to escape is to communicate.” This is a sign we have on our wall that we stress to our players before their game and its remarkable how many people come out saying, “wow, you were right, communication is everything in this game!” Use your teammates strengths and talk things out. It’s surprising how people will clearly see the answer after just saying what they are working on out loud. Sounds like I’ll have to come back in October to play Hex a third time. I love scary!!! 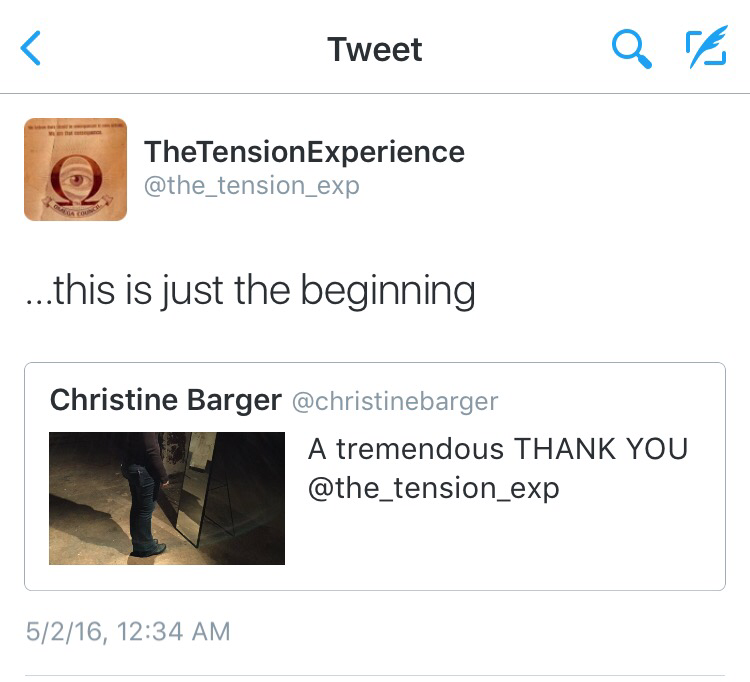 I first heard about The Tension Experience in late February from friends that described it as an interactive haunt. The thing that drew me in and got me obsessed with checking their website and social media was the puzzles hidden throughout. I didn’t label The Tension Experience in the title of this blog as I normally would because honestly I don’t know how to describe it. It’s not a haunt or a puzzle game, it’s an…experience. So far I’m not clear of the purpose of it all, nor am I concerned, I’m just enjoying the ride. The Tension Experience website allows participants to complete a fairly lengthy, personal questionnaire. After that everyone’s experience is unique. So far my journey has allowed me to have a few email and phone interactions with the OOA Institute that resulted in a live meeting in downtown Los Angeles. I will do my best to describe my experience exactly as I remember it. My meeting took place on April 30th at 8:05pm. I was given very specific instructions to arrive at a designated location alone and wait for my cell phone to ring. I waited on the corner near the bus stop watching people arrive and depart for several minutes when I heard that glorious Dr. Who theme song (my ringtone) begin. I answered and the voice on the other end instructed me to raise my right hand. I stood on the corner with my hand raised high above my head as a young, nicely dressed woman approached. She embraced me in the kind of hug your grandmother gives when she hasn’t seen you since last Christmas and started telling me how excited she was for me. She gripped my arm tightly and we walked arm in arm like schoolgirls down the dark Los Angeles sidewalk. After a short walk she paused, had me sign a waiver and then asked if I trusted her. I assured her I did and she handed me a hood to place over my head. She then gently guided me through a doorway, down a hall and into an elevator. While in the elevator that felt as though it was traveling to a basement she continued to compliment me until I asked her name. This seemed to fluster her a bit and she explained to me very thoroughly that her name, Talia, was not important and she was the lowest of the low. Then she left me alone outside of the elevator still blinded by the hood to contemplate why I deserved Enlightment and wait for someone higher up to fetch me. While I stood alone in the darkness with my thoughts someone approached and whispered the question, “What makes you so special?” Then after some pause stated, “I don’t think you are special.” Then they vanished. After what seemed like an eternity, someone approached me and grabbed my shoulders to push me quickly down more hallways to a room where I was placed in front of a mirror still wearing the hood. I was asked why I had come. Then over the next several minutes I was allowed to remove the hood but only gaze directly at my reflection in the mirror while handing off my cell phone and answering questions being rapidly fired my way. “What’s your name?” “What have you done to improve yourself today?” “What have you done to improve humanity today?” “Are you a good person?” “Who is your best friend?” “Who knows you better…your best friend or your cell phone?” “Are you a good person?” “What’s the worst things you’ve every done to another person?” “What’s your biggest regret?” “Are you a good person?” Then I was told by a male voice that it only takes 2 minutes to completely download the information from a cell phone and they had done that. I was instructed to replace the hood on my head and shoved back down the hallway that smelled of burning candles to have my phone placed in my hand as a woman’s voice told me that they were not who they seemed and gave me instructions to look my attendant in the eyes and say something specific once my hood was removed. I was then passed off to Talia and escorted in the elevator and back to the entrance. We had a quick exchange and then I was heading back with instructions not to interact with anyone between there and my car. The entire experience took about 40 minutes. I was not allowed to mention anything of my experience until after all applicants had completed their experiences that evening. Lucky for me I only had to wait about 15 minutes. It was all quite exciting and fun. Well, that first moment when my phone was removed from my hand was a bit stressful. It’s not everyday unlock my phone and give it to a total stranger. I was surprised to find the above photo of myself hooded in front of the mirror in my photo gallery. I have since been checking The Tension Experience forums and sharing stories with other participants about their experiences with the OOA. You can visit the forum and even participate once you create an account on the site. Participants also discuss theories about the experience as well as plan meet ups and discuss puzzles on the site. It’s quite a community. If this blog post has peaked your interest be sure to check out the site. Anyone can be part of the online action, however live events appear to only be happening in the Los Angeles area. Not only is it a unique and thrilling experience, so far it’s been free. You will only get out of The Tension Experience what you put into it. So join the community and get active. Update 1: I received this tweet tonight which has me excited for what’s to come. Update 2: The OOA is always watching!!! Within minutes of posting this blog and sharing it on Twitter (around 2 am) I received a surprising call on my cell phone from a blocked number. The mysterious voice on the other end called me by name and then proceeded to tell me something to the effect of my account of the event had been noticed and I had done some good in light.